NASA?s nextrover, the Mars Science Laboratory, finally has its new name: Curiosity. The namecomes courtesy of Clara Ma, a 12-year-old sixth-grade student at Sunflower Elementary school in Lenexa, Kan.
"Wehave been eager to call therover by name," said Pete Theisinger, who manages the JPL teambuilding and testing Curiosity. "Giving it a name worthy of this mission'squest means a lot to the people working on it." The roveris expected to launchin 2011. A NASApanel selected the name following a nationwide student contest that attractedmore than 9,000 proposals via the Internet and mail. Name suggestions from theMars Science Laboratory project leaders and a non-binding public poll also wereconsidered. "Studentsfrom every state suggested names for this rover. That's testimony to the excitementMars missions spark in our next generation of explorers," said Mark Dahl,the mission's program executive at NASA Headquarters in Washington. "Manyof the nominating essays were excellent and several of the names would have fitwell. I am especially pleased with the choice, which recognizes somethinguniversally human and essential to science." Ma decidedto enter the rover-naming contest after she heard about it at her school. "I wasreally interested in space, but I thought space was something I could only readabout in books and look at during the night from so far away," Ma said. "I thought that I would never be able to get close to it, so for me,naming the Mars rover would at least be one step closer." "Curiosityis an everlasting flame that burns in everyone's mind. It makes me get out ofbed in the morning and wonder what surprises life will throw at me thatday," Ma wrote in her winning essay. "Curiosity is such a powerfulforce. Without it, we wouldn't be who we are today. Curiosity is the passionthat drives us through our everyday lives. We have become explorers andscientists with our need to ask questions and to wonder." 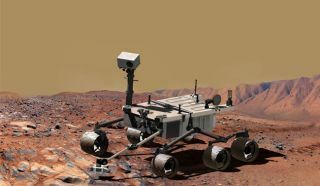 As herprize, Ma wins a trip to NASA's Jet Propulsion Laboratory (JPL) in Pasadena, Calif., where she will be invited to sign her name directly onto the rover as itis being assembled. Walt DisneyStudios Motion Pictures supplied the prizes for the contest, including 30 forsemifinalists related to "WALL-E." Nine finalists have been invitedto provide messages to be placed on a microchip mounted on Curiosity. Themicrochip also will contain the names of thousands of people around the worldwho have "signed" their names electronically via the Internet.Additional electronic signatures still are being accepted via the Internet. Curiositywill be larger and more capable than any craft previously sent to land on thered planet. It will check to see whether the environment in a selected landingregion ever has been favorable for supporting microbial life and preservingevidence of life. The rover also will searchfor minerals that formed in the presence of water and look for severalchemical building blocks of life.